Save up to 30% on 3 Day Special. Only in Slow Season. Best rate guarantee! Don't pass up this offer, Rent a Mustang GT today! 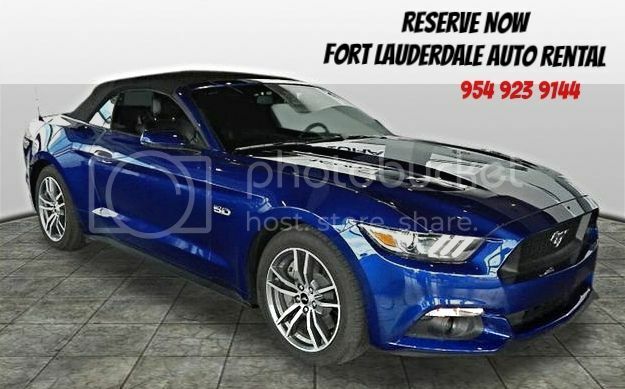 Rent a Mustang GT convertible at the best rates, Fort Lauderdale Auto Rental has the latest model. Rent a Mustang GT at cheap rental rates in Fort Lauderdale, Florida only at Fort Lauderdale Auto Rental. Daily, weekly, and monthly at fantastic cheap rental prices on Mustang Gt Convertible . The iconic Mustang GT with an even more powerful punch, this has a 5.0L V8 engine that pushes out 420 HP with a 6 speed shiftronic automatic transmission. Inside you'll find a vehicle packed with a ton of premium features such as a eight inch touch screen, power seats, windows, and a fully automatic convertible top that gives a breaktaking view of the Florida skies.